When you are in the market for an indoor hammock chair you have a lot of options available. Not many will allow you to purchase an extremely comfortable and durable chair while transforming families and communities. That is the opportunity that the Sedona Hanging Hammock Chair by Yellow Leaf Hammocks provides. Let’s get all of the technical aspects of this chair out of the way. 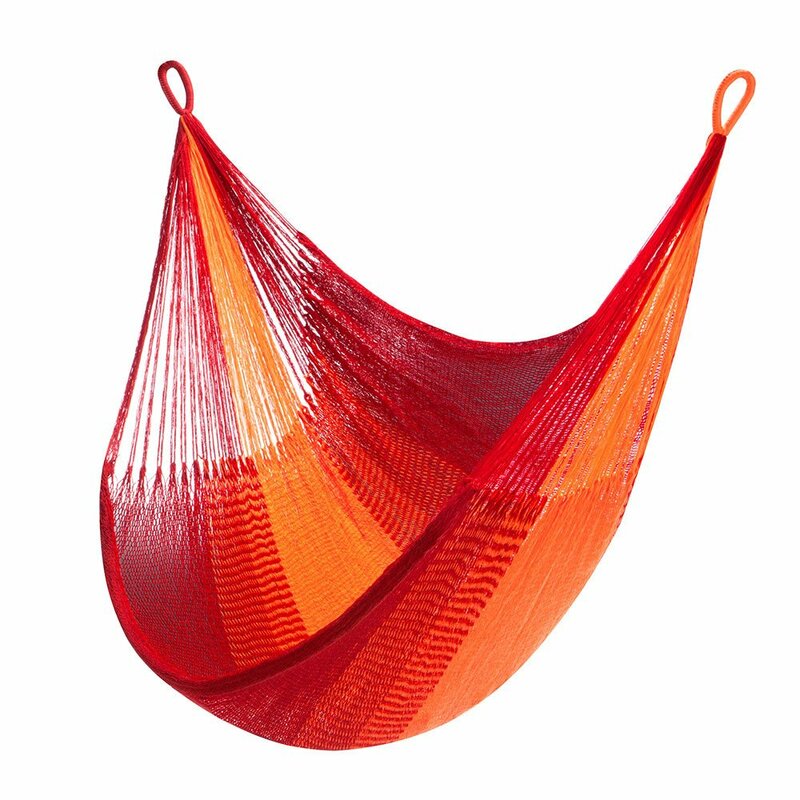 The Sedona Hanging Hammock Chair comes in vibrant crimson red or blaze orange colors and has a weight capacity of 330 pounds. This makes it sturdy enough to hold most full-size adults. It is 4 feet wide by 7 feet long and only weighs 1.4 pounds. A person who is over 6 feet tall and comfortably stretch out in this hammock without concern. It can definitely be used as a chair or for a full-length hammock experience. The optimal hanging distance is 3-5 feet and the optimal hanging height is 5-7 feet. 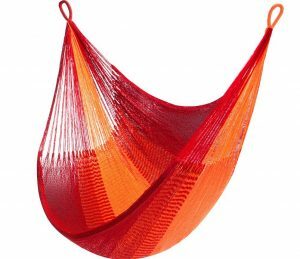 This is a great sized hammock for large or small spaces. 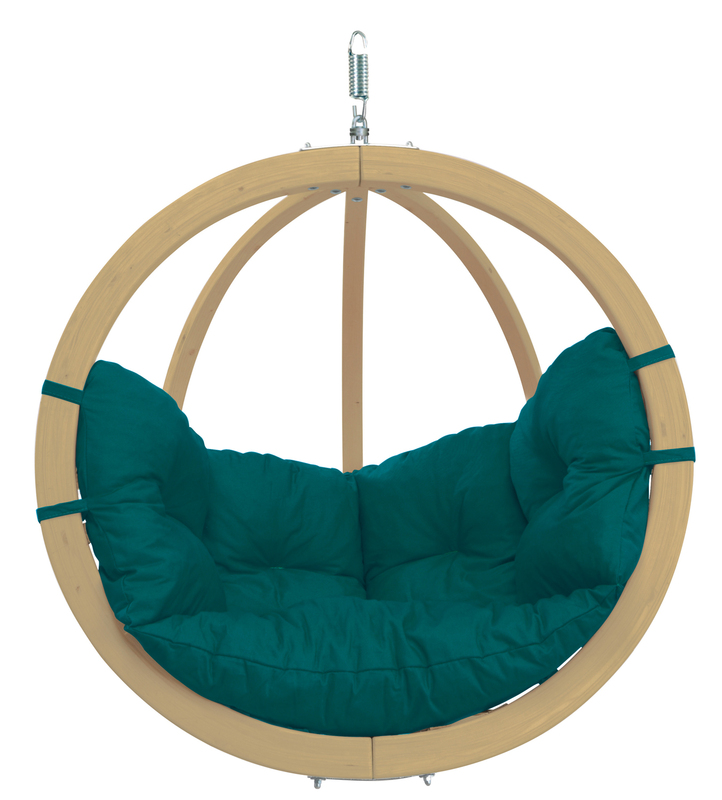 The Sedona Hanging Hammock Chair is one of the most comfortable indoor hammock chairs available. Already when unpacking this hammock chair you will notice immediately one detail : The quality of the fabric. The chair is extremely soft and smooth, 100% hand woven with over 2 miles of yarn. It takes 3-4 days for the workers in rural Thailand to complete just one hammock. 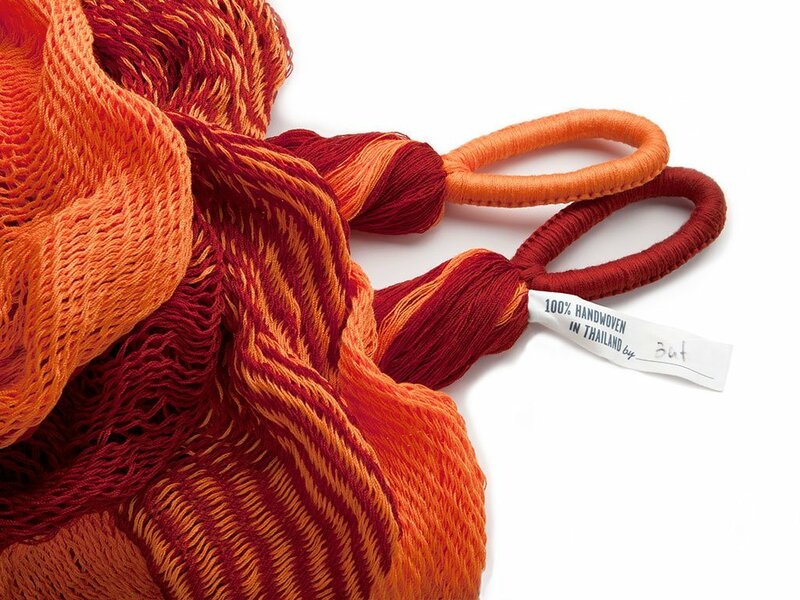 The soft-spun acrylic performance yarn is completely weatherproof and UV-resistant. This makes the hammock “lazy proof” when used outdoors because it will last in all types of weather. The proprietary weaves in the Sedona Hanging Hammock Chair are specifically designed for maximum comfort. These are free-flowing weaves which contour perfectly to a person’s body making it feel almost weightless. Many customers report to nodding off for a nap without even realizing it. The fabrics is also very breezy helping to keep you cool during a hot day and avoiding any unintended sweating. The yarn used to weave the hammock chair is extremely soft and has a silky feeling on the skin. It also prevents a waffle imprint which is dreaded by any experienced hammock owner. Overall, the hammock chair is extremely comfortable and well-designed putting it up there with the top hammock chair options available today. When you take into account the good work that purchasing this hammock helps Yellow Leaf Hammocks do, it is hard to imagine making a better purchase. As you might have been able to tell by the name of this hammock, every Yellow Leaf Hammock is named after a unique vacation destination. They believe that this is one way to make your home a vacation inspired oasis. This specific chair is inspired by Sedona. Sedona is the glowing red sandstone of the southwest. The Sedona hammock is designed to reflect breathtaking sunsets and amazing views. 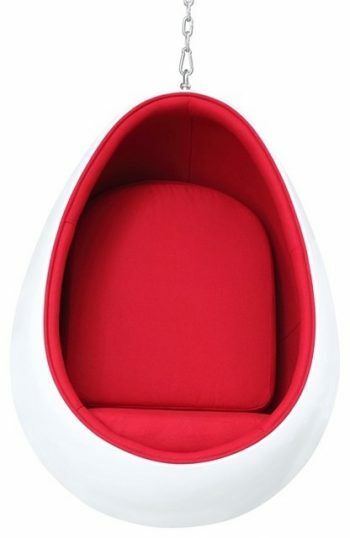 This is reflected in its vibrant colors and extremely comfortable design. There are more than a billion people in the world who live on less than $1.25 per day. In Thailand there are more than a million people shut out of the job market leaving them vulnerable to exploitation and being forced into trafficking. Yellow Leaf Hammocks believes that the solution to this problem is ethical job creation. To help combat these injustices Yellow Leaf Hammocks is not just making donations, they are working directly with families to provide sustainable employment. They employ three weaving communities creating jobs for mothers and building communities. They pay a “prosperity wage” allowing their artisans to escape poverty and debt slavery. When you purchase an indoor hammock chair from Yellow Leaf Hammocks you know that your money is supporting a good cause. 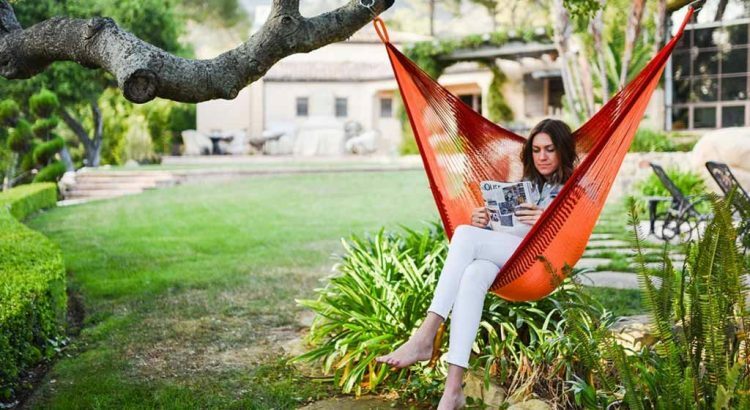 Here you can find 7 good reasons, why to hang a hammock chair in your home. When you want to purchase a high-quality indoor hammock chair and support a great cause, the Sedona Hanging Hammock Chair is one of the best options. 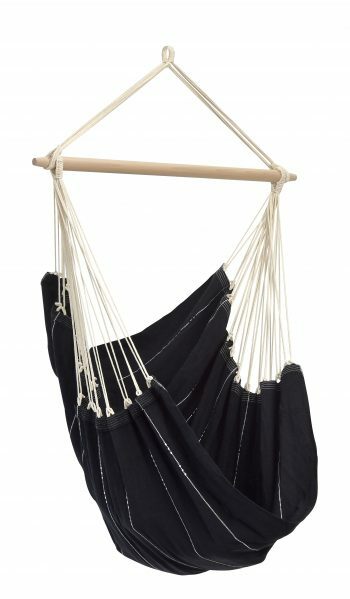 The hammock includes a signature hammock tote that allows for easy storage and transportation. It also comes with a copy of Hammocking 101, a guide for easy set up. Yellow Leaf Hammocks also has “Hammock Concierges” ready and available to answer any questions that you may have. It is not every day that you can purchase a top of the line hammock and make a positive impact in the world. Buying the Sedona Hanging Hammock Chair allows you to do just that. You should consider purchasing one today.